After two entries and images of fire damage, and two entries about outrage, and because the schedule has become snarled and I am unable to write a blog for this week, I am offering some pure pleasure -- two manuscript images I have recently come across. Thanks to Konstantina Papakosma for the beehives, which come from an 11C manuscript (probably 1050-1075) in the Patriarchal Library of Jerusalem. 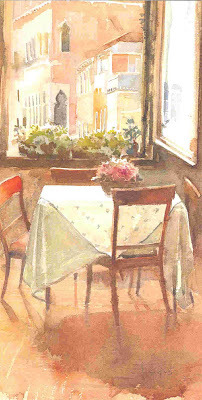 The originals of these evocative watercolors by Marianna Gabriel hang in various rooms of the Greek Institute of Venice, the Istituto Ellinico di Studi Bizantini e Postbizantini di Venezia, and they bring back memories. 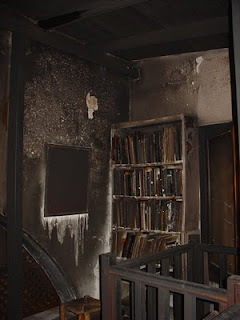 On the night of January 5 and again on January 15, Etz Hayyim synagogue of Chania on Crete was firebombed. The library of books and manuscripts dating back to the 17th century was destroyed. The building itself dates from the 14th century. From May 1944 until 1999, the building stood in ruins, desecrated by the Germans and local residents, then Nikos Stavrolakis -- nearly the last Jew on Crete and founder of the wonderful Jewish Museum of Greece, led a group to bring back Etz Hayyim as a living building. Etz Hayyim means Tree of Life and while it will no doubt flourish again, now there is grief and shock, and Stavrolakis has lost his personal books and papers. Links about the fire are below, but this is about what happened to 98% of the Jews of Crete. On 29 May 1944 the Jewish population of Crete -- essentially the Jews of Chania --were rounded up by the Wermacht. These included Jews who had come to Chania from elsewhere. The Jews of Euboea had been collected in March, those on Corfu, Rhodes, and Kos were collected in June and July. Archbishop Damaskinos of Athens went to magnificent lengths to protect Athenian Jews: no such claims can be made for any other Greek archbishop or, indeed, any other archbishop in Europe. In Chania, the Germans allowed the neighbors and the homeless to loot Jewish property: photographs of this were used to demonstrate "popular anti-Semitic agitation." The Matsas book (link below) has accounts from Jews who saw, as they were being led away, their neighbors carrying off their possessions. After the war, Cretan Jews who had fought with the partisans were punished by the collaborationist government. Samuel Dentis, age 18, was shot by a firing squad. Iosif DeCastro and Salvator Minervos were sent to the prison island of Makronisos -- these names give the history of Crete in miniature. On June 10, Chania's Jews, along with 48 Christians who had been caught in anti-German actions, and 112 Italian soldiers who would not fight for the Germans, were loaded onto a cargo ship -- the Danai or the Danae or the Tanais, depending on your preferred form of transcription. En route to Piraeus where they were to be loaded onto trains, the ship was sunk. It was originally thought that the ship was sunk by a German bomb on board, but is seems sure now that the ship was sunk by the British who were known to be sinking possible German shipping in the Mediterranean. These are the missing Jews of Chania. Samuel Gruber's Jewish Arts and Heritage blog is the source of the photograph here and gives more information on the fires..
U. S. State Department statement. If you did not read it already at the link above, read Archbishop Damaskinos' protest against the German treatment of the Jews and his response to the German threat of execution. Nikos Stavrolakis, The Jews of Greece. Michael Matsas, The Illusion of Safety. When I wrote the last entry, I had not yet seen Anthony Kaldellis' new book on the Parthenon. * I was unable to borrow a copy locally, and it is expensive enough that we had to think a good while about buying our own. But we did, and the book has now arrived. It has a little more on the fire, much more on other topics, and some very interesting images. 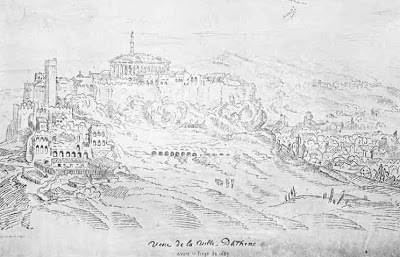 Here you see Manolis Korres' drawing of what the Parthenon must have looked like after the catastrophe. Korres leaves more standing than I would have thought one could hope for, but perhaps he is drawing on Evliya's description of two levels of fluted columns. Some writers associate the fire with the Herulian assault in 267. Kaldellis finds evidence in Julian, and others, that it was not a ruin when he was studying in Athens in 355, and suggests it is more likely to have been caused by Alaric's Goths in 396. I'm not sure why an invasion is necessary. 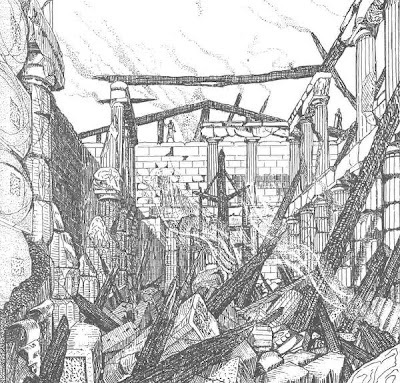 Pausanias reports a number of temples that burned because of carelessness with a lamp. Perhaps the idea of external violence is more comforting than that of an internal accident. More interesting is Kaldellis' information that Korres found evidence that the columns were rebuilt and the statue of Athena restored. Not the gold and ivory statue -- I learn that it had been dismantled and turned into cash long before -- but a replacement. 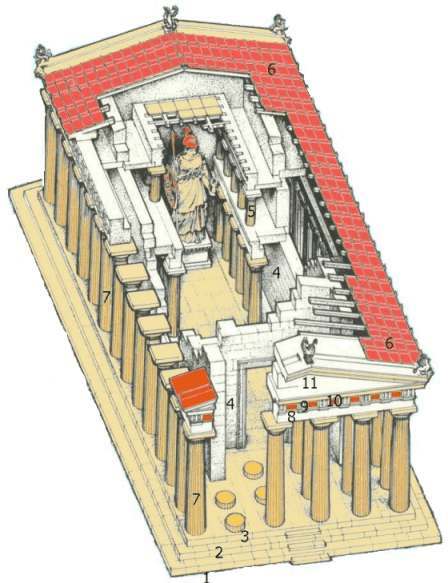 The cella was reroofed with clay tiles, but the space between the cella and the cage of columns was left open. Then it was converted into a church, and we are hopelessly ignorant of the dating of fire and repair and conversion. I was wrong when I thought that the Christians took over an empty hulk. We do not know what the Christians converted. There were a number of elements to this transformation, but I will leave them with Kaldellis, except for another image from Korres, this of the two stages of the transformation of the apse. 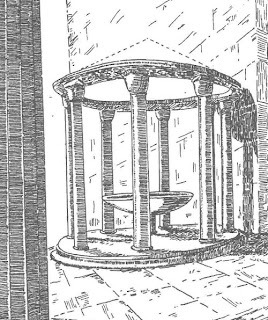 Anothere image in the book that particularly interests me is of the holy water font, or phiale, in the narthex. Evliya mentioned it, commenting on how mighty must have been the men of old who drank from it. This is pleasingly reminiscent of Nestor's cup, but Cyriaco who had seen this kind of thing in Italy did not find it impressive. Here is a drawing of it by Xyngopoulos from a drawing by Pallas, which sounds rather as if we were talking about horse breeding. 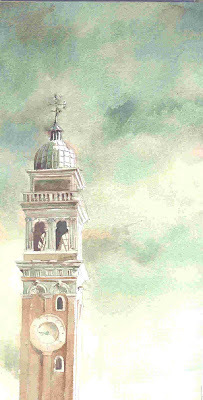 Nerio Acciaiuoli had a stud farm which he left in his will for the support of this Church of the Virgin. We do not know how that worked out. * The Christian Parthenon: Classicism and Pilgrimage in Byzantine Athens byAnthony Kaldellis. In 1676 and earlier, when Evliya Celebi visited Athens, the minaret was not in the center, but more in the right front corner of the Parthenon: this will do as an impression of what Evliya saw in the extremely hot summer of 1668. Athens was, you will be fascinated to learn, founded by Solomon. (Evliya is always interested in local history). He went up to the "walled city" which we know as the High City, commenting that its sides went down like the sides of the pits of hell. Evliya saw the "Friday mosque," not the Parthenon: his descriptions give us the single best image we have of the Byzantine and medieval church of the Virgin. Think of the Parthenon structurally as a box inside a cage of 46 columns, originally with a lid running from one side of the cage to the other. Remember the lid. That is how Iktinos and Kallikrates built it. When you come through the Propylea and head for the Parthenon, you are heading for the west end, which the ancients considered the back side. 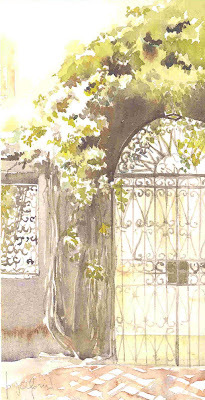 The original entrance was around at the east end. Visitors approaching from the east went through a cluster of columns and a recessed door to enter the cella with the great ivory and gold statue (We are, I think, the better off for not actually seeing Athena Parthenos). Here is an imperfect but adequate view of the interior construction. Behind the statue was a wall with an entrance to the treasury. Remember that wall. 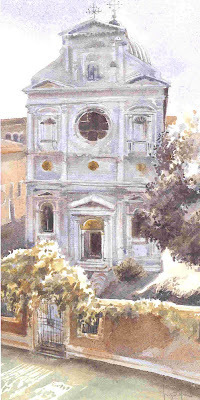 When it became a church -- probably in the 6th century -- an apse was constructed on the east end where the entrance was. Evliya was informed that Plato used to hang a lamp in that dome with naphtha-soaked wicks that were lit in the morning through the heat of the sun on special stones. Pilgrims reported an ever-burning lamp over the altar, and about 1020 Basil II had given a hanging lamp in the form of a golden dove. 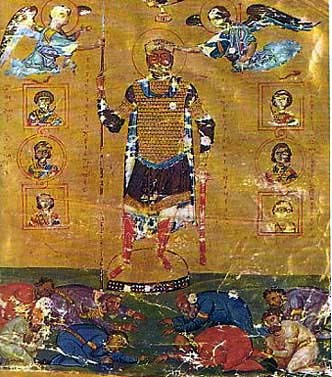 This mythical sultan is responsible for the disappearance of the jewels and treasures of the church to which Evliya keeps referring, though there were not many jewels and treasures remaining after the Franks of 1204 and the Catalans and the Acciaiuoli had made use of what Basil II had taken from his conquests in Bulgaria and given to Atheniotissa, the Virgin of Athens. When Evliya saw the Parthenon, he saw a mosque with a minaret, surrounded by 46 columns, and for most of the way around, the space between the columns and the walls was open to the sky, not lidded over. He saw sculptured scenes on the metopes between the tops of the columns, and more scenes around the top of the cella. Our interpretations are dominated by archaeologists, but Evliya was under no such handicap. The sculptures he saw contained fairies, angels, dragons, elephants, rhinoceri, giraffes, scorpions, crocodiles, thousands of mice, cats, ghouls, cherubs, and many many other kinds of creatures from this world and others in processions: one of the saved in Paradise, the other of those petrified in Hell. Evliya says these sculptures are in the courtyard. 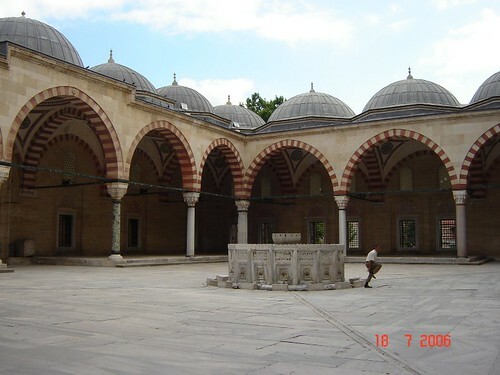 In Evliya's experience of the classical Turkish mosque, the mosque is approached through a colonnaded courtyard, like the glorious Selimiye at Edirne. 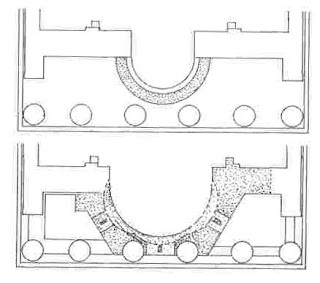 The columns here, joined by lintels but almost completely separate from the interior structure ever since the fire and the collapse of the roof, allow him to interpret the Parthenon-mosque as a mosque inside its courtyard. He was fascinated with the holy water font in the narthex which he saw as a great goblet, large enough for a man to fit inside -- the men of old must have been mighty indeed to have been able to drink so much! (Cyriaco had noticed the font, but little else.) He noticed that there had been a pipe organ over the door from the narthex into the church, but what fascinated him was a column supported by an arch. The mosque made use of the apse as a kibla, which he shows us covered with gold mosaics. The arches and walls of the sanctuary were overlaid with multicolored mosaics which reminded him of the Dome of the Rock in Jerusalem. 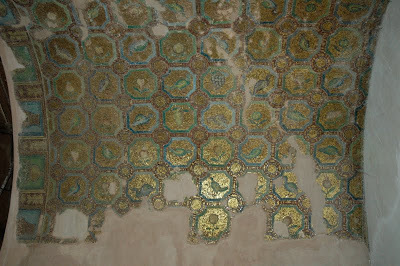 (Is there a reason there seem to be no good photographs of these mosaics on the internet?) I am imagining mosaics like these from Thessalonike. There was a gallery around the interior of the church, and the four columns closest to what would have been the altar were of porphyry. So he said, Evliya always put the best possible interpretation on what he saw. He counted 60 columns in all -- because of the gallery there would have been two levels -- all fluted and grooved. (An earlier Venetian visitor had said there were 80 -- this is the only known occasion on which Evliya produced a smaller number.) He doesn't mention the frescoes Basil gave, of which a few ghosts can still be seen, exposed to rain and Athens air for 450 years. * You will recall that a fire the night of the birth of Alexander the Great brought down the great temple of Artemis of the Ephesians. Evliya's description of Athens and the Acropolis is to appear soon in a book of Evliya excerpts by Robert Dankoff. An important new book is The Christian Parthenon: Classicism and Pilgrimage in Byzantine Athens byAnthony Kaldellis. BMCR review. Bill Caraher's review. And thanks to http://www.mlahanas.de/ for the Wheler image.